David: The word for today is: hoodoo. One word that haunts a lot of what I write is hoodoo, especially the idea of English hoodoo. The wonderful process by which England has a tendency to absorb and fuse and make wonderful new traditions from anything washing across its landscape. Today as I sat in the fete’s beer tent, under the shade of the Westway, a ukulele band played Clash songs, played Rolling Stones’ songs, played musical hall oldies. Children danced to them all. The air was thick with the smell of Kent hops and goat curry. Boats went by, bunting flapping. English crosses, Jamaican crosses. An overpowering sense of community rituals. The moments in the calendar when all this manifests. The magic of London, the magic of England coming through something as simple as a fete. 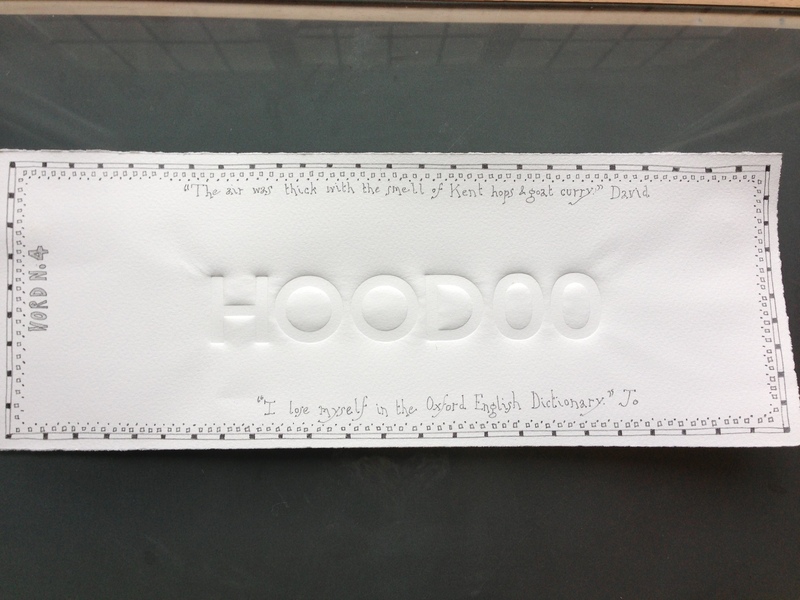 Hoodoo as part of the cultural glue. Jo: I had to look hoodoo up. Initially I thought you must have confused and meant voodoo, but immediately realized no, I was working with a wordsmith here, he must know! So rather than going to the internet for a definition I went to my wonderful ‘Compact Edition of the Oxford English Dictionary’, the one that comes with a magnifying glass. I have had this many years now, and I realize that rarely a week goes by without me using it. Much as I can lose myself looking at maps, I can lose myself in this dictionary, looking at all the meanings and where these have originated from. Many a time this dictionary has provided me with the basis of a project. So back to hoodoo, to bewitch.